You hear it everywhere, blogging and SEO helps your website, and it’s true! Blogging and SEO the Nuts and bolts can benefit your website’s traffic and your companies brand. Having a blog demonstrates the depth of industry knowledge your brand has, proving to the readers that you really are experts in this field. When the potential customer is in the research stage it’s your chance to stand out. Being viewed as adept and helpful is a great first step in attracting visitors. This brings us to the other great benefit of blogging, the increased traffic, you can start to see how these go hand in hand. We explain what it takes to write a search engine optimized blog post, and why you should take the time to perform each step. This 6-7 minute read covers the proper format, keywording, and behind the scene SEO tactics. 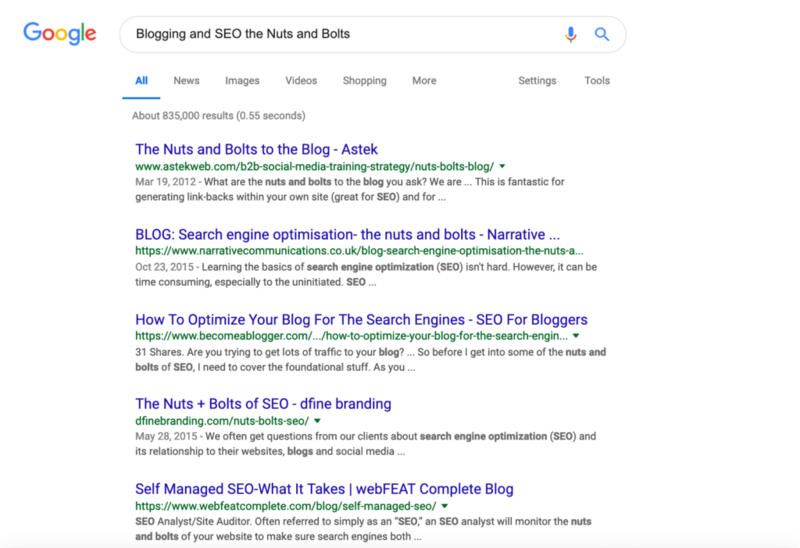 Before we get down to the hardier points of SEO there are three simple steps you can take to start your blog off right: Notice first the title above, an H3, Blogging and SEO the Nuts and Bolts, is also the page title. Following the Yoast SEO tool plugin recommendation that you have at least one Header tag that is also the page title. Remember when you first began to write multi-paragraph essays in school and your teacher would give you an outline paper, yeah I wasn’t a fan either. Well, they’re back and they’re bigger. Before you begin, planning out your blog post is going to help a lot (I made one for this post). You need to know what it should be about, the content it’ll cover, and where you will organically place keywords. Outlining your post beforehand will help it read more fluently. This may help you generate new content ideas. Researching the topic before you begin will smooth out the process of writing. Already having sources to use when writing instead of having to search for them mid-paragraph will save you time. The research also should include reading other blog articles on the same topic. This will give you an idea of keywords, length, and what has and, more importantly, hasn’t been covered. After you’ve finished these two steps the fun begins! Having a strong title is going to help readers AND search engines find your article. They both will determine the relevancy of the blog from it. IMPORTANT: include your keyword within the first 60 characters of your title. This is the number of characters displayed on the SERP (search engine results page). It may not be the first thing you think of with SEO and writing blogs, but the format of the blog post will have a lot to do with the overall rank of the post. Implementing the correct use of headers, length, URL name, and being mobile friendly will improve the initial rank of the article. Use headings throughout your post, they break up the paragraphs and can help readers find specific sections they may be more interested in, or re-read. Having a more scannable blog can decrease the bounce rate, and help your rank. Headers that include keywords are the most robust headers and increase rank the most, but don’t make it too long just to get a keyword in it. A header should be kept around the length of your title. Save the length for the blog post itself. The length of a strong blog post has changed through the years, and have only grown longer. The length of the article can directly improve your rank and shouldn’t be overlooked. 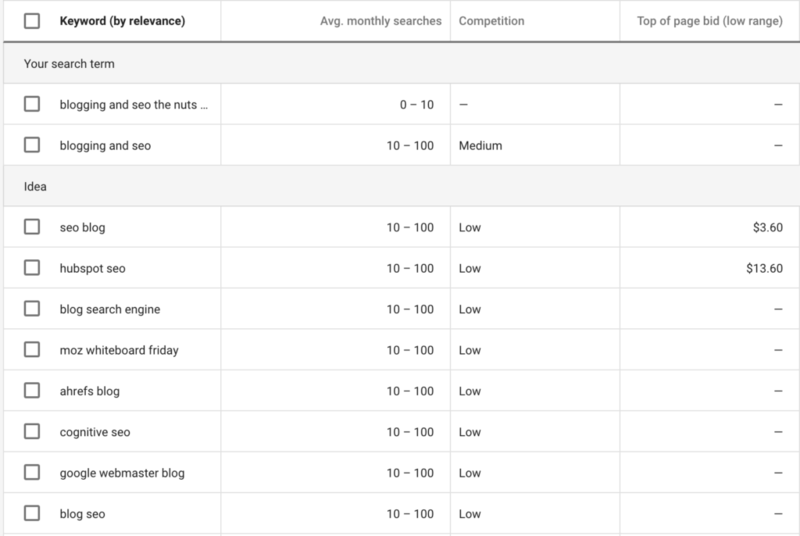 Google will rank your article higher if you have over 1,000 words. It isn’t uncommon today for blog posts to contain between 1,800 and 2,500 words. The increased length will give more chances to include more organic long-tailed keywords, and organic long-tailed keywords are the strongest keywords. When including those important keywords, try to put one in the URL. Optimizing your URL is great for the readers and for the search engines. It tells the search engine what the page is about and including keywords or two strengthens your rank even more. This formatting step is crucial, you may be reading this blog post on a phone right now, and even if you’re not you can’t exclude those who choose to. The extreme growth of smartphones has forced Websites to become mobile friendly. If it’s not, you’re risking the chance of having a higher bounce rate because reading a desktop view on a phone is not an enjoyable experience. If you use WordPress templates, most are mobile ready, and if you use a page builder you can style the page for mobile viewing. Following this formatting approach is going to make everyone happy, readers, search engines, and you! At this point in your article writing process, your post is looking pretty strong, but it might feel like there’s still room for improvement. 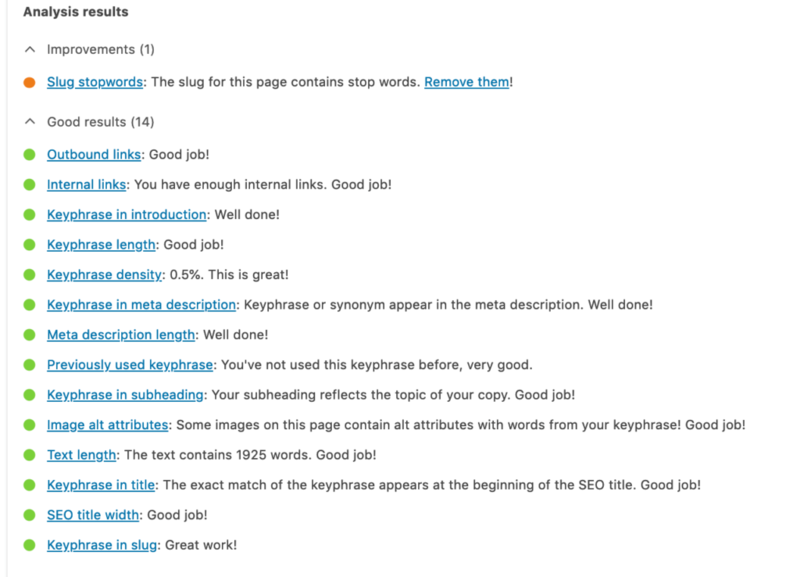 One way you can always improve your blog article is through keywords. Writing is not the easiest task for most, but having to include certain words through your writing only makes it harder. But don’t fear, there are ways to improve your keyword count in the blog article, and in turn, improve your rank. When you’re writing the blog post and placing keywords, there is a right way about it. What you want to avoid is keyword stuffing. This is when you overload the page with keywords to manipulate the ranking of the site. Overusing the keyword will harm the rank and search engines have changed their algorithms to combat people attempting this tactic. This is where organic keywords come in. In the case of this article we try not to use the page URL, Blogging and SEO the Nuts and Bolts too many times. The Yoast plugin shows that we have used the page URL 0.5% or about 9 times throughout the post. Organic keywords are a very strong form of keyword use when your keywords are placed in sentences and can be read naturally and fit where they’re placed search engines applaud and increase the pages rank. It is difficult at first but the more you write, you’ll begin to place keywords in organically without thinking. Another way to increase the number of keywords on a page is by using long tail ones and short tail ones. A short tail keyword is 2-3 words, while a long tail keyword is more than 3 words. Each has its own benefit, the short tail will bring more search volume but are more competitive. Long tail keywords have a lower search volume but the competition for them is also lower. Implementing both long and short-tailed will help search engines find your page and say “this is a strong page”. Implementing them into a blog post is tricky, but like everything, will become easier with practice. But you may still wonder “How do I know which keywords to use?” Well, let us tell you, through keyword research. Blogging and SEO the Nuts and bolts examines many things. Like finding the right keywords is as important as using them, you should use variations of them and we have 3 ways you can do this. The first, and simplest way is by simply typing the topic into the search engine. From here, you will see what other people have searched for when looking for your related topic. It will give you other terms to use, and give you an idea of what your desired reader wants to know. Lastly, and this is the trickiest one because it is easy to get frustrated and stumped. Putting yourself in the shoes of who your reader will be. Think about what you would want to know about if you were in need of information on the topic. What you would search to find this information out. This will help you find the keywords to use in your writing and could reveal new information to include in the article. Now that you’ve formatted, wrote, and included keywords, you might think it’s ready to post. Wait! There are some minor final touches that should be included. These final touches happen in the article that won’t be seen by the reader, but by the search engine and help the rank of the page. Speeding up your website is important, both for yourself the website owner and the visitors to your website. Should I mention that Google is obsessed with page speeds? Faster sites mean a better user experience. And there are a number of free tools that you can use to evaluate your page speeds. Blogging and SEO the Nuts and Bolts was not the page in this speed test it’s Slocum’s home page. Page Speed is an open source Firebug/Firefox if you use that browser and add-ons this site will give you suggestions to improve your page speed. YSlow is another free tool from Yahoo. Web Pagetests shows pretty good detail, a waterfall view of your pages. Again, they show load performance and an optimization checklist. You can also see the performance of your website in Webmaster Tools, Lab. Using images in a blog post is smart, not only does it give the reader a visual, but you can add alt text to it and further optimize the page. Alt text is text placed on the file of the picture that tells search engines what the picture is about. When adding alt text to a picture, don’t overdo it, keep it short and include keywords. Often times you can refer to the page URL in this case, Blogging and SEO the Nuts and Bolts. You should always use internal links, on any page you can. Internal linking creates more traffic for your site and tells the reader that you have more to offer them. You can link to other pages, posts, and articles that are relevant to the blog topic, like this blog post on home page designs that are SEO friendly or that explain a term or topic that might not be common knowledge. In addition to this, it will help google form an idea of your website structure, making it appear stronger than those who don’t internally link. You should also consider using a link to your contact us page, making it easy for readers to contact you. The meta description is a preview of a page’s content for readers to view. It gives them an idea of what they’ll learn when they open your page. When writing the meta description, you should view it as bait for them, optimize the text so that it contains keywords they’d search for and entices them to read further. Meta tag description should include the page title, in this case, Blogging and SEO the Nuts and Bolts. If you’d like more help with writing your blog article, Yoast makes a plugin that you use to optimize your posts and pages. It’s really helpful in guiding you through the key areas of SEO or page optimization. Like keyphrase density, as in the number of times, we used the page URL, Blogging and SEO the Nuts and Bolts in our content. In addition to Keyphrase, there’s a section on Readability results, just below. Try to go for as many green dots at you can get! We hope this article helps you with your next blog post! If you have further interest in SEO, you might want to read this article in our 4 Tips For A Successful Online Business, or feel free to contact us! Thank U for this wonderful blog post! learned so much!! !